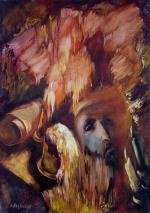 Alexander Gallery.Alexander Gallery Original Artworks and Limited Edition Giclee Prints on Jewish Life themes. Dear Customers,I like to inform all my dear customers that all the pictures that are in auction department from today will be sold with 20% discount. This action will continue only 15 days until January 18, 2019. 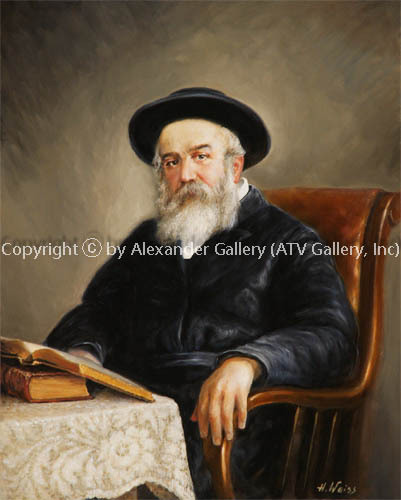 Ha-Admor Mi-Munkatch-Rabbi Chaim Elazar Shapira. Now Discontinue Sale Prices!!! Giclee is a high quality print on canvas. The advanced quality of Giclee artwork reproduction makes it the top choice over older, inferior techniques. With almost control over the final product. Giclee printing gives more freedom that ever before. Individual requirements can easily be accommodated for each client/buyer, including changes in size, color, what the image is printed on, and alterations within the image itself. When printed on canvas, the print can be beautifully stretched, varnished, textured. All finished pieces resemble the original work so closely that they often look identical and are hard to distinguish from one another. Aluminum metal prints offer a unique way to display the artwork. The ink infused directly onto aluminum and the result is an impressive, luminous print full of vibrant color, vivid detail, and unsurpassed resolution, visual depth that they appear nearly 3D. This modern print style comes in high-gloss. Aluminum metal prints transform images into lightweight, museum quality, metal wall art without the need for a frame or glass. ANY YOUR OFFER WILL BE CONSIDERED. 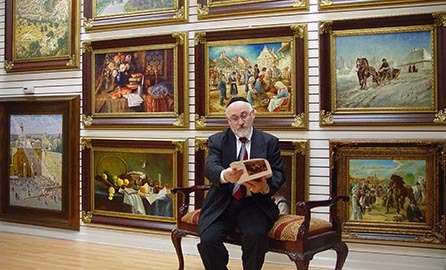 After playing a pivotal role in the global Judaica art scane for over 40 years, the Alexander Gallery closed its doors. But the Gallery still continues to sell the art collection online at big discounts. My friends and customers can visit my website, chose and order any painting in incredibly low prices. Copyright ©­ by Alexander Gallery (ATV Gallery INC). All rights reserved. No images or part thereof may be copied, reproduced, and transmitted, in any form or by any means, electronic, mechanical, photocopy, or otherwise, without the prior written permission of Alexander Gallery (ATV Gallery INC).